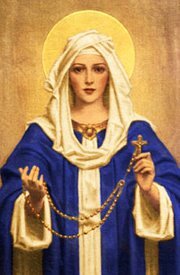 This short invocation to Mary, the Queen of the Most Holy Rosary, is an appropriate prayer for the Month of the Holy Rosary, as well as for reciting at the end of the rosary. In this prayer to Our Lady of the Rosary, we ask the Virgin Mary to help us to cultivate a habit of interior prayer through the daily recitation of the rosary. This is the object of all of our prayers: to arrive at the point where we can "pray without ceasing," as Saint Paul tells us to do. This theologically rich prayer to Mary, the Queen of the Most Holy Rosary, calls to mind our Blessed Mother's protection of the Church - as, for example, at the Battle of Lepanto (October 7, 1571), when the Christian fleet defeated the Ottoman Muslims through the intercession of the Queen of the Most Holy Rosary. This prayer for the Crusade of the Family Rosary was written by Francis Cardinal Spellman, the cardinal archbishop of the archdiocese of New York in the mid-20th century. The Family Rosary Crusade was originally an organization, founded by Fr. Patrick Peyton, dedicated to convincing families to recite the rosary together daily. Today, we can pray this prayer to spread the practice of the daily recitation of the rosary. In that vein, it is especially appropriate to add this prayer to our daily prayers for the Month of the Holy Rosary.